The Outlook Express Address Book stores contact information for easy access when sending email. Although it appears that Outlook express has its own address book it actually uses the windows address book(WAB). The windows address book is a stand alone application which you can access without opening outlook express. To open the address book go to programs>accessories>address book. There are many different ways of adding contact information to the Outlook Address Book. Here we will look at the different ways that it can be achieved. In Outlook Express, on the Tools menu, click Options. reply to in my Address Book. name, and then click Add to Address Book. and then click Add Sender to Address Book. Click the addresses icon ( not file>import). The address book opens. Select File>Import Address book (WAB). Select the .Wab file to import and click ok and the address book will be imported. Select the .csv file to import and click open. You can now change the address book to name mapping (not normally done). Click Ok when import complete and and close the import window. Open the address book.- click Tools> Address Book. a contact. (see address book folders). Add any information you would like to include in the other tabs. and then click Business Card (vCard). drive, select it, and then click Open. Double Click the business card icon. This feature doesn’t work particularly well as most of the directories aren’t locatable . If you want more information on this feature consult the address book help files. 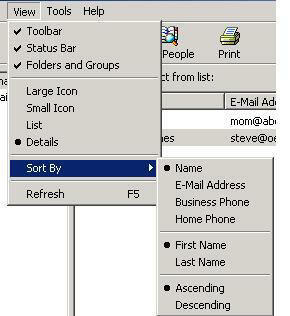 Its possible to create folders in order to organise your in outlook Express addresses/contacts. To create additional folders simply right click the main identity folder and select new> new folder and give the folder a name. 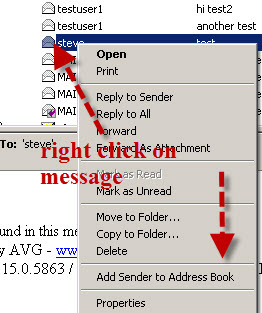 also copy them by right clicking the contact and selecting copy. Copying contacts is not advised as the two contacts are not synchronized , meaning that if you change the details of one they are not changed in the other. This folder is used for sharing contact/addresses with other Outlook express users. Families typically share a computer and separate their email using outlook Express Identities. The shared contacts folder is ideal for storing contacts that the whole family use. To move a contact into the shared contact folder just drag it their and the contact details will be visible to anyone logging on using any other identity. Although folders can be used to group email contacts together they are very different from mail groups. Contacts can belong to multiple groups but only one folder unless of course you create a copy (see above). You cannot export the folders you create as a .csv file. It is only possible to export the main identity folder as a .csv file (format used to transfer the address book between clients/systems). Also if you export the address book in WAB (Windows address book) format then then contents of the folders are exported, but the folders themselves aren’t. If you have a large Address Book then you may want to organise it to suit your preferences. To sort contacts by name, e-mail address, or phone number, click the appropriate column heading above the name list or select it from the view>sort by menu option. To switch columns between ascending and descending sort order, click the column heading or select it from the view>sort by menu option. To change the order of the columns, point to a column heading (Name, E-mail Address, Home Phone, and so on), and then drag the column to the left or right until it’s located where you want it. To transfer your outlook express/windows address book either between email clients like Outlook, Windows Live Mail etc or email services like Gmail and Yahoo Mail you need to export your address book in a format that is readable by the other client/service . To create a copy of your contacts/addresses so that you can transfer it either to another program or system. Click the addresses icon ( not file>export). The address book opens. Select Other Address book and then Text file (common separated values). Give the file name (contacts) and using browse store in the desired location. Select the fields your require to export and click finish. After the confirmation message click close. Give the file name (contacts), and using browse store in the backup directory you created for the email messages. To change the address book location you need to edit the registry and I would advise against this unless you really need to. registry and always come with a warning that you could seriously damage your computer if you do it wrong. with it don’t do it.